It is exceedingly difficult to convey exactly how much we are spending on all these bailouts. Whenever I start talking trillions (versus mere billions), I get puzzled looks from people. Humans have a hard time conceptualizing any number that large. I wanted a graphic way to clearly show how astonishingly ginormous the amounts involved were. So I once again went to Jess Bachman at Wallstats. This Bailout Nation graphic shows the the total costs to the taxpayer of all the monies spent, lent, consumed, borrowed, printed, guaranteed, assumed or otherwise committed. It is nothing short of astonishing. It includes the total outlay for all the bailouts to date. 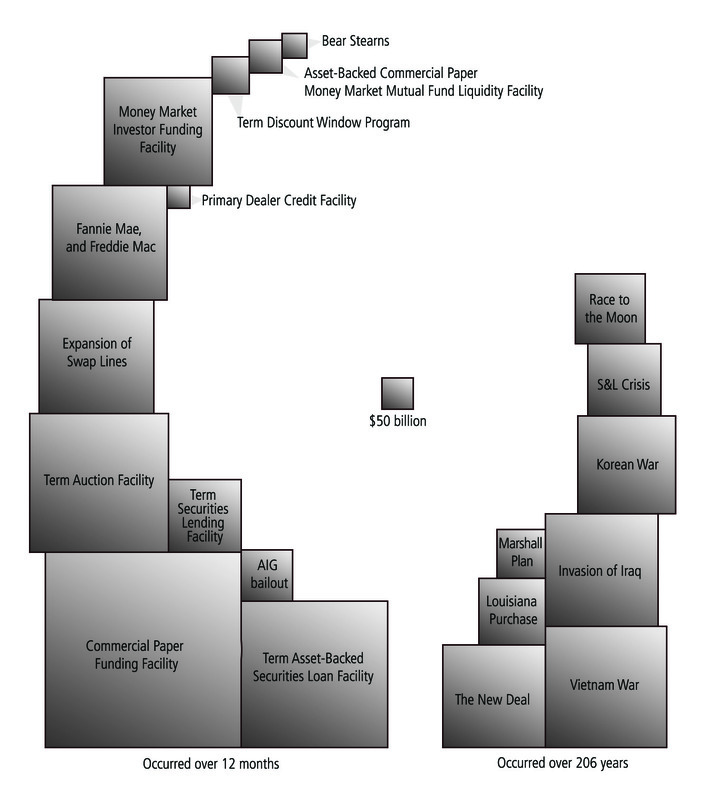 In just about one short year (march 2008 – March 2009), the bailouts managed to spend far in excess nearly every major one time expenditure of the USA, including WW2, the moon shot, the New Deal, Iraq, Viet Nam and Korean wars — COMBINED. 206 years versus 12 months. Total cost: ~$15 trillion and counting . . . Note: This was finished too late to make it into the hard cover edition of Bailout Nation, but it will be in next year’s paperback, and whenever the Kindle version finally shows up. 12 Responses to "Bailout Costs vs Big Historical Events"
If these outlays are not inflation-adjusted, then they are a bit misleading. I’m very sure if you compounded their dollar amounts to inflation, you’d see an immensely larger right side of the graphic. Nonetheless, the time period of the outlays still make it astonishing. A very telling chart, but are we talking nominal or real dollars here? Grossly misleading. These “cost” amounts for the bailout are not “net subsidies”, unlike the true costs for the historical events such as the S&L crisis. As a fellow “chart nut” I’m deeply disappointed in your choice of illustration here.I normally look forward to your posts, but this is rubbish. This is not a particularly insightful chart – a bar graph would do just the same. it is also misleading because not all of the cubes are direct outlays. In addition, the numbers (or bars/cubes whatever) should be portrayed both in real terms and as a % of GDP. 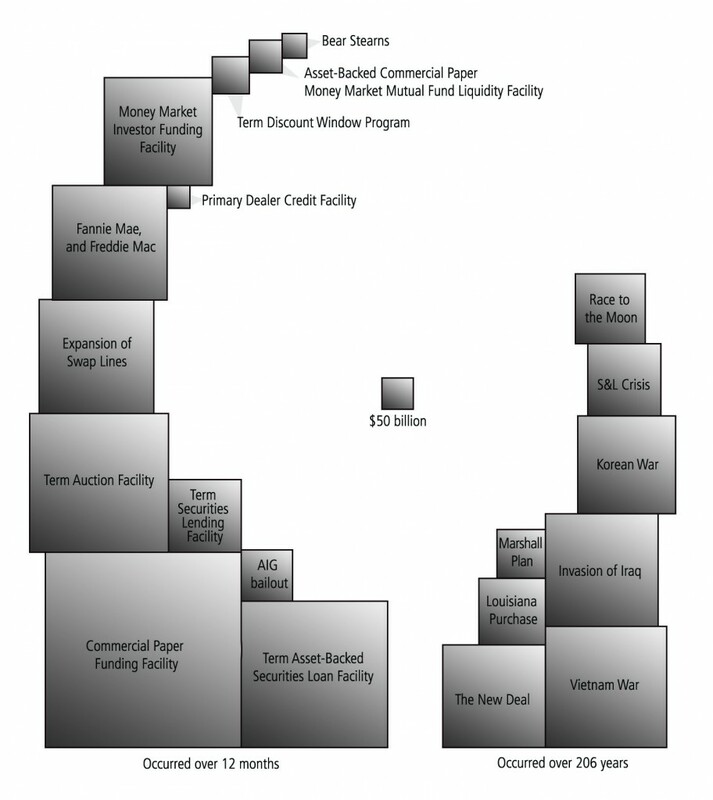 One of the things we forget is that real dollars held their value or very close to it for many many years. Oar family had a Victorian Grandma who was given UKP4 per week for housekeeping in the late 1890s when first married, and she felt no need to ask for more through the sixty plus years of her marriage.The first major inflation period we experienced in Australia was when Whitlam was in power in the 1970s. Everything went up, and has kept going. So the discount rate is uneven, as is inflation, and some others – population curves,speed of travel curves (except in cities!!).. The most interesting thing is whether we can keep climpbing the increasingly asymptotic curve, or there will be a massive crash.. I assume these are inflation adjusted but in terms of their affordability it might be more relevant to look at them as % of GDP – the Iraq and Vietnam wars are similar in terms of their actual cost but the latter was in effect considerably more expensive because it ate up a greater proportion of GDP.